KUALA LUMPUR, Dec 20 — The proposal for a Malaysian embassy in East Jerusalem has not been made to the Cabinet, said Datuk Seri Hishammuddin Hussein. The defence minister added that such a move must also be carefully explored by various ministries and agencies. “The Cabinet did not discuss this issue today, but it will be one of the agendas in the next meeting,” said Hishammuddin after a dialogue session at the Hospital Angkatan Tentera Tuanku Mizan visitation earlier. Prime Minister Datuk Seri Najib Razak reportedly said the Cabinet would examine the matter. Hishammuddin, who is also special affairs minister, said a rally planned this Friday to protest the US recognition of Jerusalem as Israel’s capital has gained support from MIC and MCA’s youth wings. He added that Opposition members were free to participate if they supported the cause. Hishammuddin arrived at the hospital at 1.20pm and spent around 40 minutes meeting with staff and patients on his ministry’s health agenda. 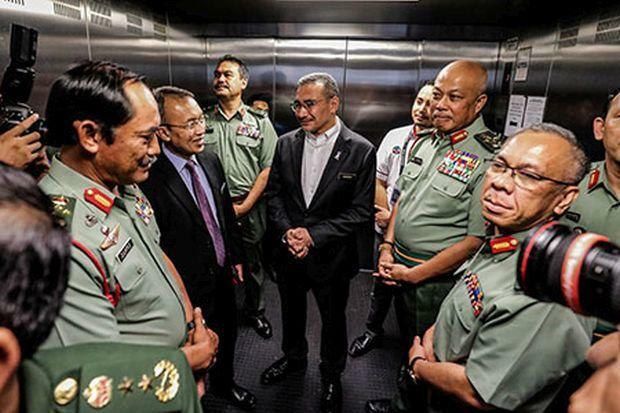 Also present were Armed Forces chief Tan Sri Raja Mohamed Affandi Raja Mohamed Noor, Defence Ministry secretary-general Datuk Seri Abdul Rahim Mohamad Radzi, and the Armed Forces health services Director-General Lt Gen Datuk Dr Ya’akop Koming.